No need to take a laptop computer out to the field. 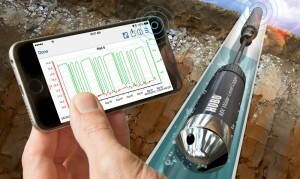 No need to pull data loggers out of a well or push a button on the logger to download data. A mobile device and the MX2001 logger, with it's hassle-free non-vented design, are all that's required for easy deployment and readout. The MX2001 logger consists of a top-end unit and a water level sensor connected by a direct read cable. Cables can be ordered in lengths from 0.2 to 500m for deployment in a wide range of wells. *Water Level Accuracy: With accurate reference water level measurement, known water density, and a stable temperature environment. System Water Level Accuracy equals the sum of the Barometric Water Level Accuracy plus the selected sensor end Water Level Accuracy. **Raw Pressure Accuracy: Absolute pressure sensor accuracy includes all sensor drift, temperature, and hysteresis-induced errors. ***Changes in Temperature: Allow 20 minutes in water to achieve full temperature compensation of the pressure sensor. There can be up to 0.5% of additional error due to rapid temperature changes. Measurement accuracy also depends on temperature response time. Battery Life:1 year, typical with logging interval of 1 minute. Faster logging and/or statistics sampling intervals, entering burst logging mode, excessive readouts, checking of Full Status Details, and remaining connected with HOBOmobile will impact battery life.